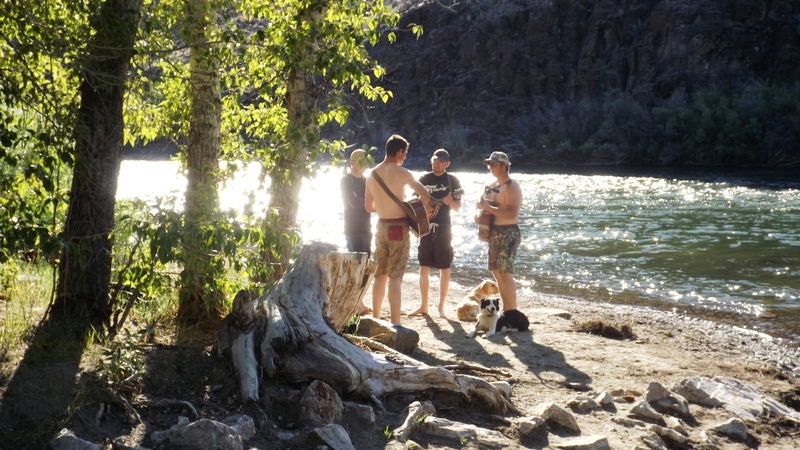 Sunday there was music down by the swimming hole. Four young fellows unpacked their guitars and a mandolin to sing for the girls splashing around. Here they are: decent, clean-cut lads playing something they all knew the words to. Randy Jackson would not have found them “pitchy”; their voices were pretty good and the playing was well-timed and in tune. Was their music an acoustic version of California Girls or, is it Hank Williams, Jr. in Family Tradition? No, it was folk singing, which could be why the girls left. Or maybe it’s that the dudes were all singing lead, at the same time, with no harmony. We’ll never know, but them fellas struck out and had to make that long walk back to the dugout amid the groans and whispers of the remaining audience. We caught a few fish on the river here. My first was a rainbow big enough to eat in south Louisiana or France as part of a bouillabaisse with shrimp, mussels, or crabs. But I’m not a fan of fish stews. He returned to the water unharmed and maybe wiser. I caught a 12 inch mountain whitefish yesterday, and Kat took this picture. As I was told by a prominent dermatologist moments after taking superficial but bloody head cuts in a head-on two car crash years ago, “Faces bleed.” That fish swam off like a shot when released. A storm came up yesterday and cooled things off a bit. I caught a whitefish so small he would have been “catch and release” to an osprey. Kat pulled in a nice whitey this morning. 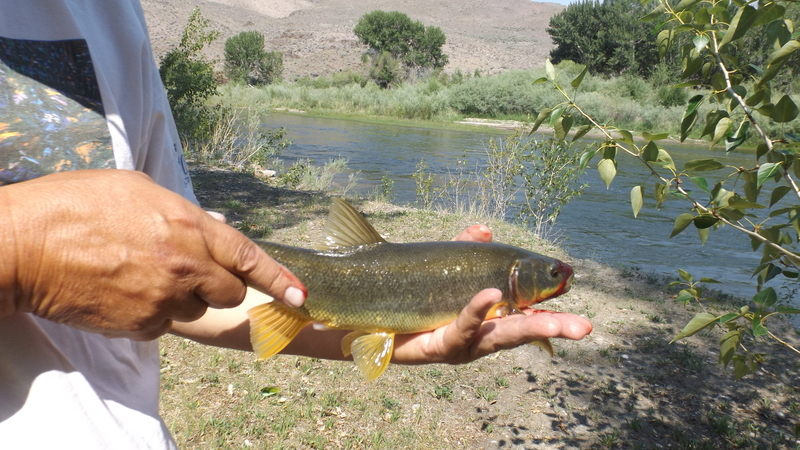 We had found some recipes for mountain whites, and figured to catch two or three more and have a nice fry. Her fish went into a huge Tupperware container of river water. They stopped biting. Kat relocated and I went to get more water. When I got back the fish had made a break for it. He’d jumped out of his tank and flopped to the water’s edge, all muddy and dirty, now looking more dead than alive. I slip-slided down the rocks to bring him back. The fish noticed my reach, and with a powerful adrenaline-aided flop propelled himself into the water where mud, sand, and fish together dashed to freedom. We’ll have fried fish tonight. There’s some battered fish parts in the freezer.